After my first trip to the farmers’ market this year, I went a little crazy stocking up on fresh produce. Only once I got home did I start scouring the internet for ideas on how to use it all. 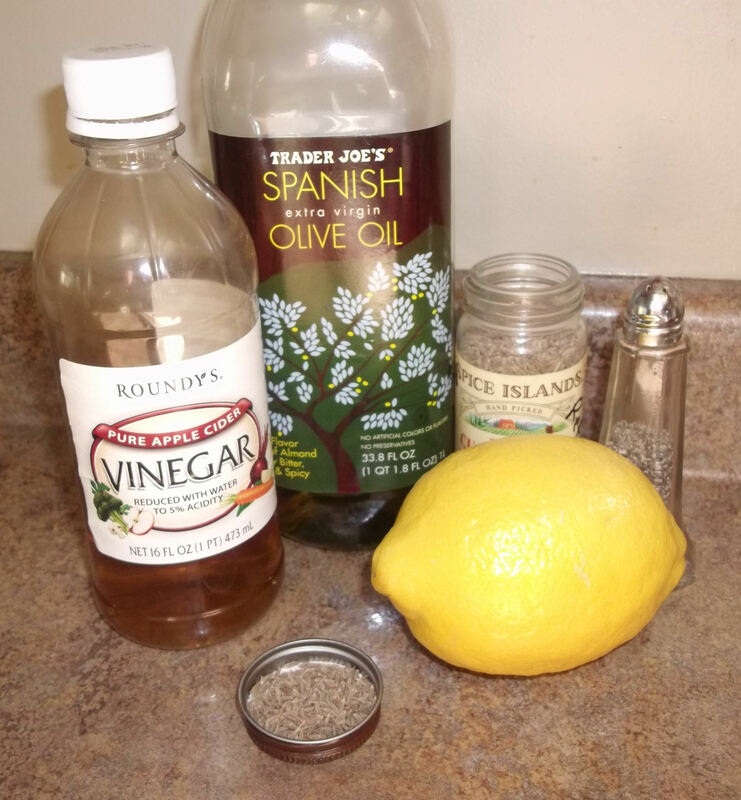 I came across this recipe, adapted it for the ingredients I had on hand, and gave it a try. It’s a bright and colorful side dish that will look and taste great with any summer meal. Serves 6-8. Combine all the dressing ingredients in a large bowl and set aside. 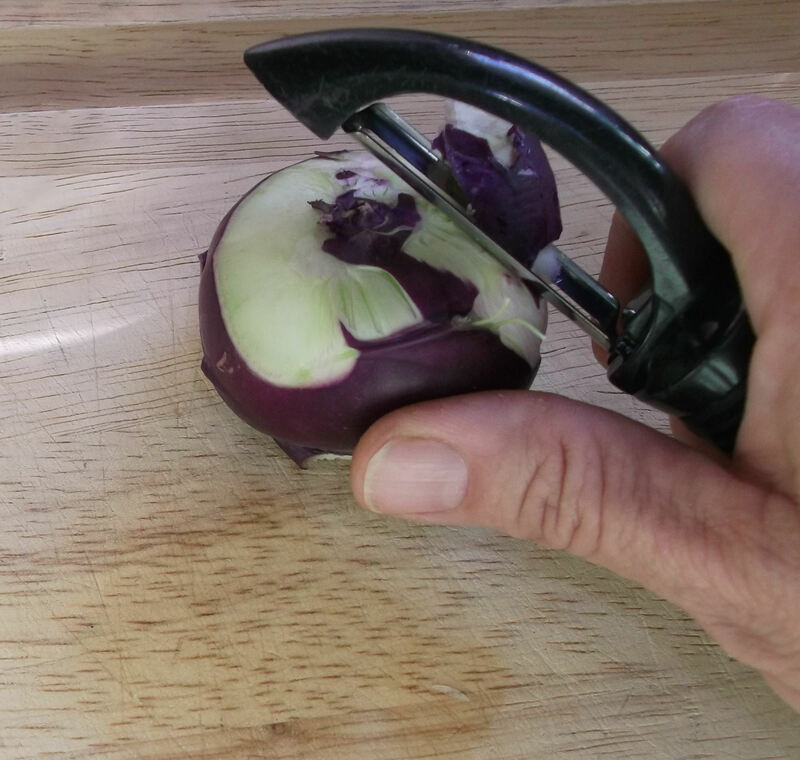 Slice all the vegetables thinly, about 1/8” thick, using a sharp knife or a mandolin. Cut them into same-sized pieces for a more even texture. Kohlrabi: slice off the top and bottom of each Kohlrabi and peel the outer, colored layer. Slice it and place the sliced kohlrabi into the bowl of dressing. Stir to coat it well, and let it sit while you prepare the rest. Carrots: wash and peel the carrots, slice them, and add the sliced carrots to the kohlrabi in the dressing, stirring to mix well. 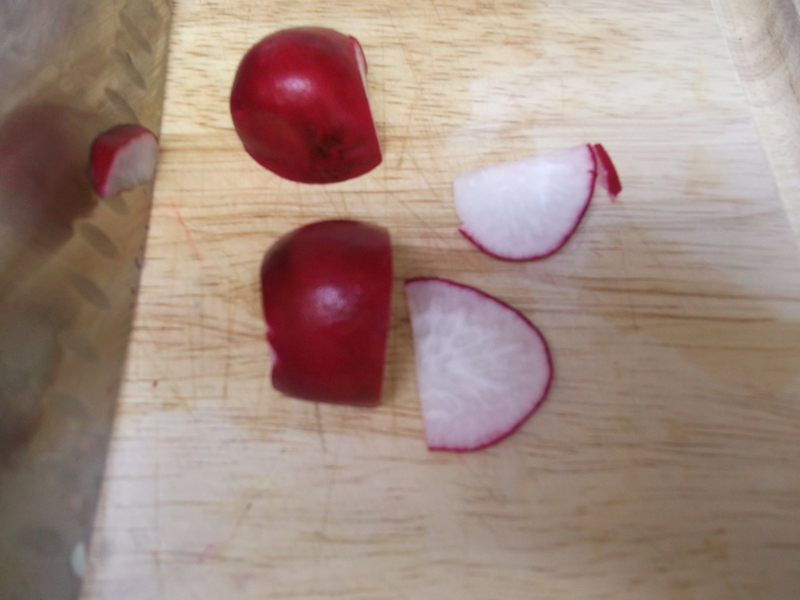 Radishes: trim, wash and slice the radishes and add them and the carrots and kohlrabi. Stir well to coat, and let sit at least 30 minutes. Just before serving, stir again and garnish with fresh chopped parsley. Combine all the dressing ingredients in a large bowl. I forgot the garlic in this photo, but remembered to add it to the dressing just in time! Feel free to use any other spices and seasonings instead of the cumin or in addition to it. Basically, just clean the veggies and cut them into same-sized pieces. 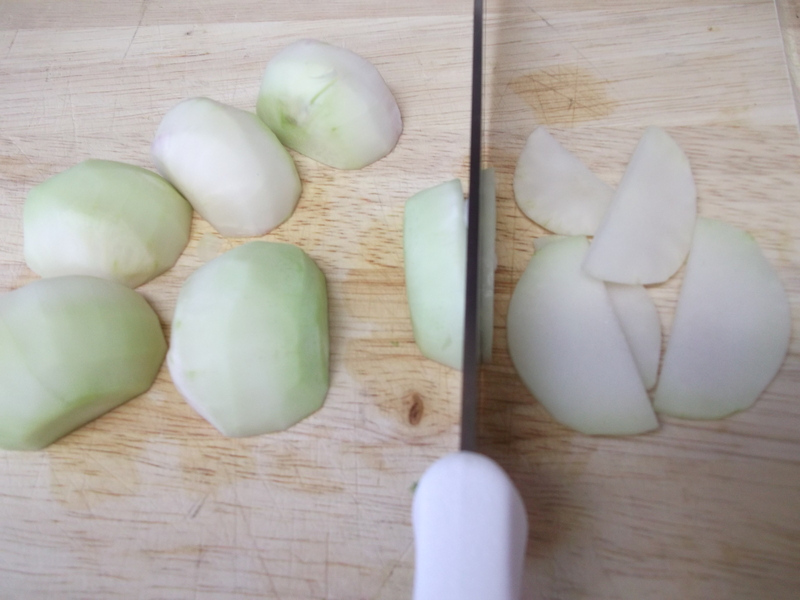 Slice off the stems and the top and bottom of each Kohlrabi and peel the outer, colored layer with a vegetable peeler. If you were expecting the purple kohlrabi to be purple inside, like I was, don’t be surprised to find it’s not. Cut each one in half and slice thinly, with the cut side down. 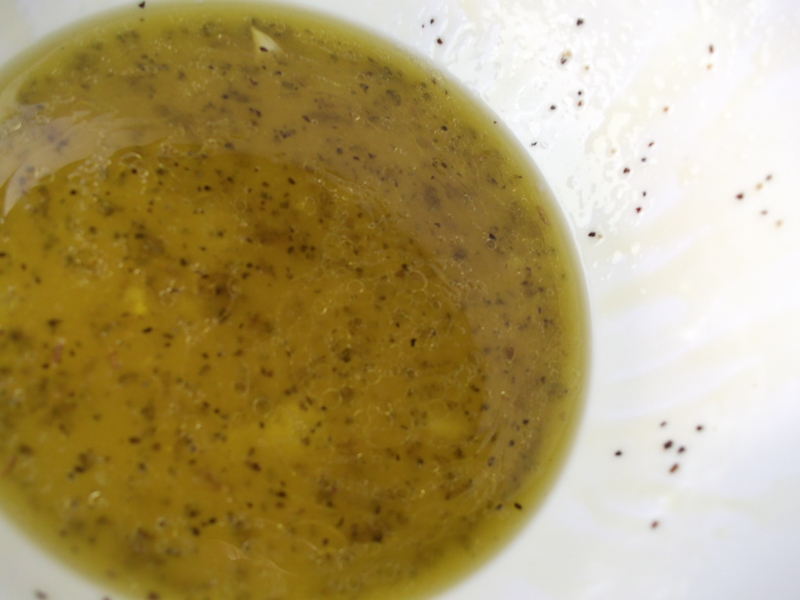 Place the sliced kohlrabi into the bowl of dressing. Stir to coat it well, and let it sit while you prepare the rest. Wash and peel the carrots, then slice them thinly. Holding them tight together will make this step go a little faster, and will help them from rolling around. Rolling objects and sharp knives don’t usually go well together in my kitchen. 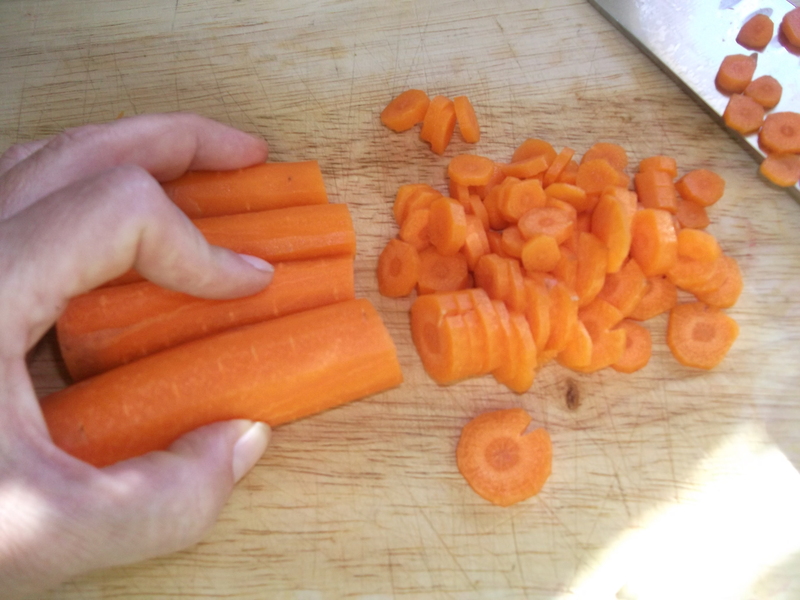 For the large ends, cut each carrot in half lengthwise and slice thinly, with the cut side down. 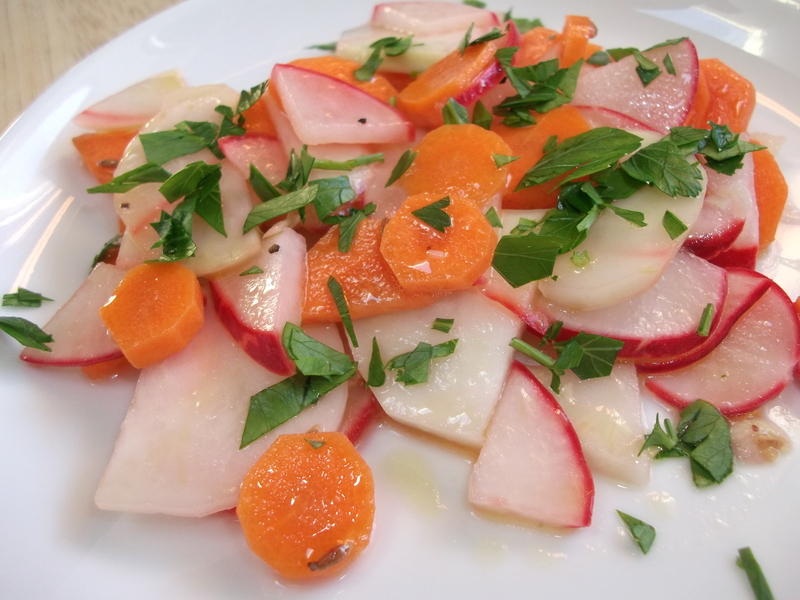 Add the sliced carrots to the kohlrabi and the dressing. Wash and trim the tops and bottoms from the radishes. Cut each one in half and slice thinly, with the cut side down. 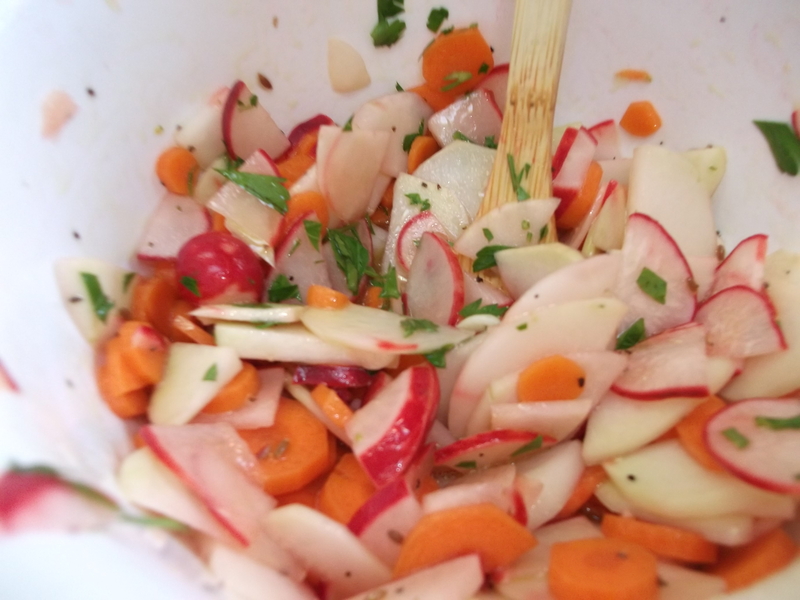 Add the sliced radishes to the carrot and kohlrabi mixture. Stir well to coat, and let sit at least 30 minutes. Just before serving, stir the mixture once again and garnish with fresh chopped parsley. Enjoy!